Do you ever just need to create a quick outline by eye without thinking about the size. This macro can quickly create outlines and shadows with a couple mouse clicks. The mouse clicks are the distance of the contour, inner or outer! For v.2018 only! Round corner options, Beveled corner options and default corner options are your choice. Just select a shape (combined, grouped, whatever) and place 2 clicks for outline/shadow distance. Place the first click on the shapes edge and place the second click the distance you want the outline created. Presto! The contour is automatically placed, SEPARATED and FILLED in the color or random color of your choice. Your choice of fill and outline color comes in handy too. Outline color choice is popular for sign makers so you can instantly create a cut contour line around your shapes. Other options include the ability to remove interior holes so you can make a contour around a shape and not the inside. Make it easy on yourself...try this one! 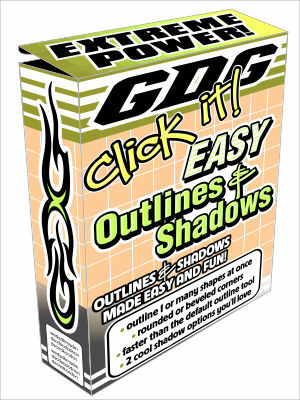 -Includes FREE Bonus Macro GDG Contour Quick. Makes a quick contour. Very handy for slightly thickening thin items for vinyl cutting or just a frequently used contour distance. See dialog at start up which appears one time only and helps describe macro. Includes 2 icons also! -7 customizable presets. See instructions by making form expand by clicking grey triangle at the bottom of the main form. -Ability to make a separate inner or outer contour for each shape selected. Extremely handy! Simple hold SHIFT when running via the Outer Contour, Inner Contour, or Preset button. -Invert and Random Fills ability. Quick change between User, Random, and Inverted fills by clicking the label in the Fill section. -Quick UNIT change. Now quickly change documents units for macro use. Make a contour in mm then inches, then... Easy and fast. -Improved: Faster way to change the mode for Default contour type, pop out menu. -Improved: Lock feature for click-able contours now needs only one click for each sequential contour after the first. Before you had to make 2 clicks each time. Now simply make your 2 clicks for the first contour, then a single click for each thereafter at desired distance. Keep making contours on the last contoured shape until you press escape. Try in tandem with the inverted and random fill feature! -This MACRO has been almost completely re-coded and optimized. Many tiny enhancements and improvements! -Hover mouse over the macro buttons and labels to read a handy HOW TO tool-tip. This macro is for version v.2018 of CorelDraw only!